A new Connected Learning Lab (CLL) at the University of California, Irvine will focus on equity-oriented, learner-centered innovation in education technology. 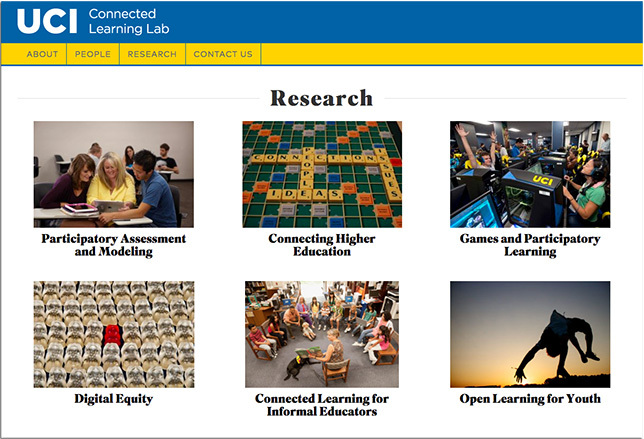 Sponsored by UCI's Donald Bren School of Information and Computer Sciences, School of Education and School of Social Sciences, as well as the UC Humanities Research Institute, the lab will serve as an interdisciplinary hub for research and innovation, providing an "experimental site for pushing the boundaries of connected learning." "Connected learning happens when someone is pursuing a personal interest with the support of peers, mentors and caring adults, and in ways that open up opportunities for them," a CLL statement explained. "It differs from technology and institution-centered approaches to educational technology in being people-first, prioritizing student interests, cultural relevance, and the life of communities." The approach "brings together the learning sciences, social sciences, design, informatics and computing to develop new research frameworks, engage in pressing real-world problems, and develop and test breakthrough innovations." "Participatory Assessment and Modeling," an initiative to rethink how learning is valued, assessed and measured by leveraging the principles of participatory learning. "Emerging forms of personalized, networked, and game-based learning represents a massive new wave of innovation in educational technology that is already impacting millions of learners around the world," said Mimi Ito, CLL director, in a statement. "The CLL is dedicated to ensuring that these innovations are informed by robust research, and lead to positive outcomes for learners in all walks of life. The lab includes interdisciplinary networks of faculty members across the UCI campus, from informatics and education to the social sciences." For more information, visit the Connected Learning Lab site.